Cooking with Vân : Thai chicken basil ( serve 4). 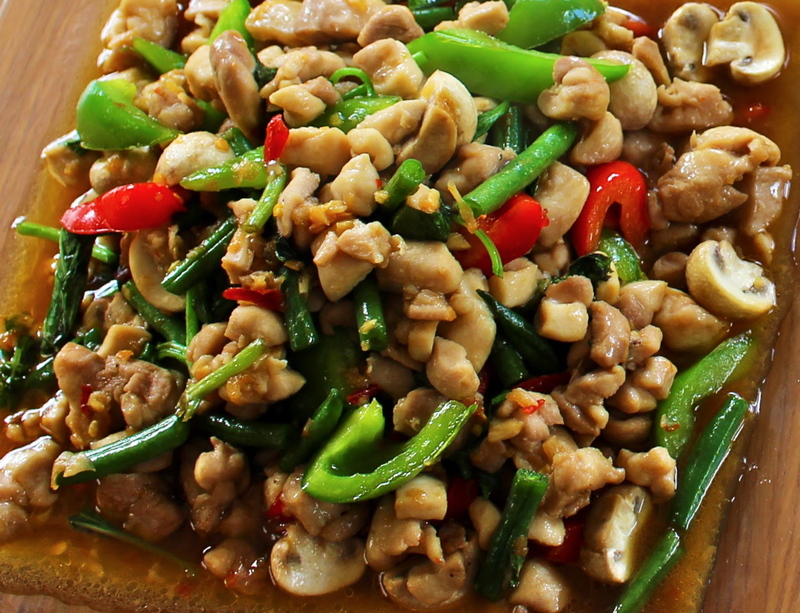 Thai chicken basil is one of the most easy dish to make and it's a good introducing dish to anyone who is not familiar to Asian food. My kids love it. In this version I make it mild and you can add a little bit more sugar if you want to make sure the kids won't be put off with new dish. Kids love anything sweet so why not add the real sugar by yourself and cut it down gradually. The main flavour of this dish is the purple sterm Thai basil with bright mint and citrus flavour, few places you can find are Asian shops and the amazing Ballymaloe cooking school where they grow the original Thai basil. I substitute them with the sweet basil that could be found in most supermarkets and it works well in my classes. 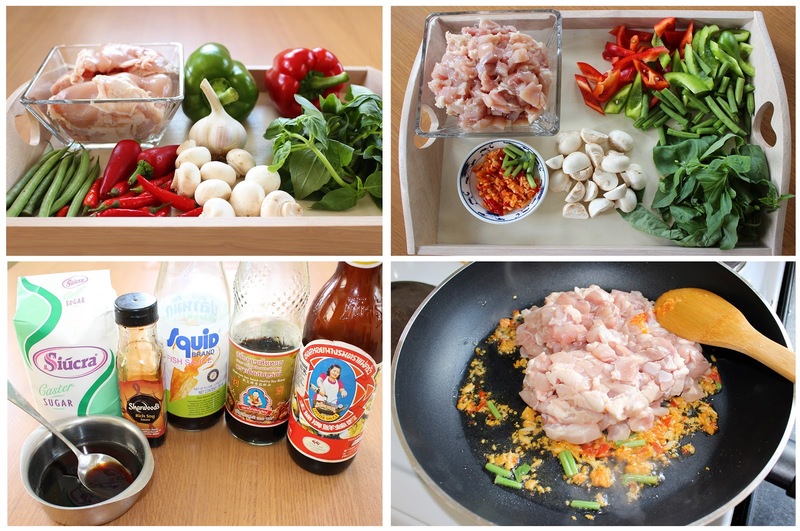 Another key seasonings is the Thai oyster sauce. This is the only oyster sauce I use for my cooking, you can find them in some butcher shops, Asian shop with 2 labels: one is Thai Gold and other one is in the pic with a cooking lady on the label. I don't really use Chinese oyster sauce because they are too strong for me and it often take over the flavour of the dish. They work ok for this dish but cut down the portion. 500gr boneless chicken thigh, cut into bite size( you can find this in Tesco or at the butcher). 1 green and 1red peppers. a handful of French beans. 1 big red chili 2 small bird eye chili only ( fresh chili is very hot). 10 baby mushrooms or as much as you prefer. 3 table spoons fish sauce. 1 table spoon dark soy sauce. 2 table spoons soy sauce. .Crush the garlic and chili finely, I also cut the stems of the basil to add more flavour to the dish. .Cut the chicken and veggies as in the pics. .Add little cooking oil to a frying pan. Fry the garlic, chili and basil stems for1 minute on medium or slightly high heat. .When they turn golden brown add in the chicken and mix well altogether. .Add in the seasoning mixture, mix well and cook for 4 to 5 minutes. .Add in the peppers and french beans. 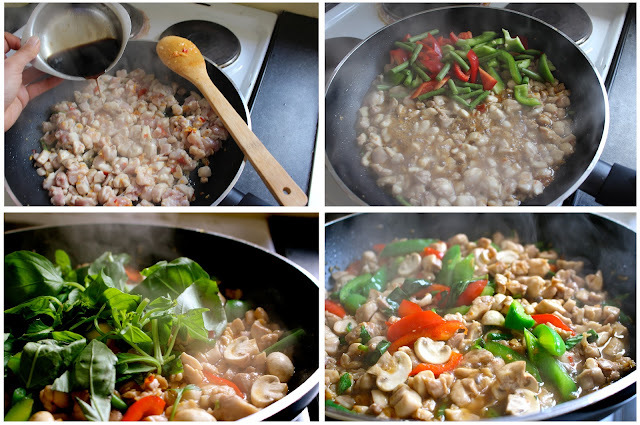 Mix and cook for 2 minutes, then add in the mushroom and cook for further 2 minutes. Finally add in the basil, mix well, taste again and adjust the seasoning as your liking. Turn off the cooker and it's ready to serve with steamed rice.